CBS News will host the second Democratic debate on Saturday, Nov. 14 at 9 p.m. Eastern Time from Drake University in Des Moines, Iowa. Live coverage will begin at 8 p.m. ET. The two-hour debate includes former Secretary of State Hillary Clinton, US Senator Bernie Sanders and former Maryland Governor Martin O’Malley, and will be hosted by Nancy Cordes, Kevin Cooney and Kathie Obradovich. Since CBS is a free broadcast station anyone should be able to tune-in to their local CBS affilate and watch the 2nd Democratic debate. Just be sure to select the HD version of the channel! CBS News has mobile apps for Apple iOS, Google Android, and Windows devices. Just download the app from the device’s app store to stream over Wi-Fi or 3G/4G networks. The CBS News app is available for streaming media players including Apple TV, Fire TV, and Roku among others. Just download the app from the player’s app store if you haven’t already to stream the debate using internet service. CBS News will also broadcast the debate on radio stations nationwide, available over-the-air or through local affiliates or apps such as Radio.com and CBS Radio News apps for iOS and Android devices. 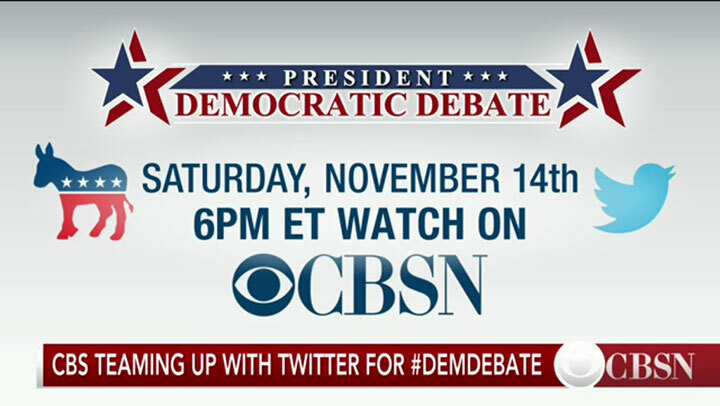 Twitter has also partnered with CBS for the debate, so Twitter users will be able to follow the conversations and trending tweets throughout the broadcast. You may try use allavsoft to download CBSNews Video to MP4, WMV, MOV, FLV, AVI, etc. I am flabbergasted that CBS is not putting the Democratic Debates on On Demand for television viewing! CNN has put the Republican debate On Demand but there are NO Democratic debates on that service. That’s ridiculous. Even with great online service, streaming TWO Hours of programming is not acceptable. I think this is a real disservice to democracy. People should be able to watch the debates ON TV anytime they want. The second Democratic debate apparently will not be seen in the Raleigh/Durham area, which is screening college football instead!! And if you live in this area and want to see a political debate, FOX News is airing a rerun of their last Republican debate. Oh boy.